NavGraphicXL system automati- cally displays the vessel's exact po- sition on a screen showing a de- tailed chart, which reads from a com- pact disk containing dozens of digi- tized NOAA charts. The compact Acutis 6 is an inte- grated six-channel GPS antenna/ receiver that mounts above board like an antenna. WATERCOM has installed hun- dreds of telephone fax and data units on vessels navigating America's in- land waterways. With WATERCOM, callers dial numbers directly; there is no need for an operator to complete the call. Waiting to make connections is vir- tually eliminated, and the system offers improved clarity and privacy. It also offers modem and facsimile data transfer capabilities. Business calls are billed on an itemized usage statement. Personal calls made by crew members must be made collect, billed to a third party or charged to a credit card. The company never sees a bill for them. Incoming calls are the dialing party's responsibility. WATERCOM is reportedly the only direct dial, delay free, continu- ous communications system on the water. The system serves more than 4,000 miles of America's waterways. Marine Positioning equipment to surveying, dredging and military authorities for over two decades. The 586 Digital Distance Mea- suring Unit (DDMU) is fully com- patible with existing Trisponder systems, and may operate with any remote transmitter/receiver units already deployed. The Del Norte 1008/1012 GPS receiver is a 586 DDMU fitted with a GPS module and is capable of carrying out all functions of a micro- wave measuring unit at the same time as operating as a GPS receiver. Del Norte 1008/1012 resident soft- ware enables operation as either a shore-based reference unit or a shipborne mobile unit. Line ships which regularly call at the port. The use of the Seaward fenders enabled a critical delivery schedule to be met and the fenders were in- stalled without any costly modifica- tions to the pier being necessary. Additionally, to match the clean appearance of the ships hull and to eliminate the black marking caused by other types of hard rubber fend- ers, and by the rubber tire fenders previously used at the pier, the Sea- ward fenders were supplied with a white non-marking exterior. The fenders, along with complete mount- ing hardware, were shipped within two weeks after the order was re- ceived and were installed on sched- ule and are currently in operation. Seaward International is an elas- tomer technology company which manufacturers marine fenders, buoys and elastomer coatings. 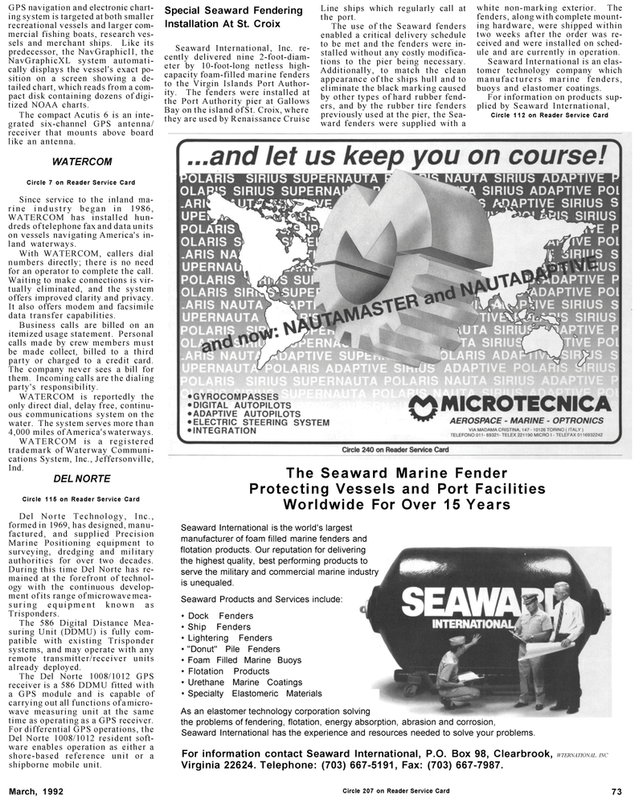 Seaward International is the world's largest manufacturer of foam filled marine fenders and flotation products. Our reputation for delivering the highest quality, best performing products to serve the military and commercial marine industry is unequaled. Seaward International has the experience and resources needed to solve your problems. Virginia 22624. Telephone: (703) 667-5191, Fax: (703) 667-7987.